What is “Maximum allowed spots per occurrence” ? You can use this feature to limit spots/places per occurrence. For example if you are selling 3 tickets each with 100 spots but you want to limit the total spots to 100 then you will enable this feature and set it to 100. In other words if you want to sell only 100 tickets disregarding of the type of the ticket then enable this and set it to 100. How to turn off multiple bookings ? In Settings > Booking tab you can turn it off by toggling Multiple Booking off. This will remove the “Quantity” section from the booking form. How to limit people to X number of tickets ? The first setting will limit a user to X tickets per occurrence. That means that each email can only book that much. The second setting will limit a user to X tickets per booking session. That means that booking is limited to X per booking. Thus potentially the same person can book unlimited tickets in different bookings. What is a sub ticket ? 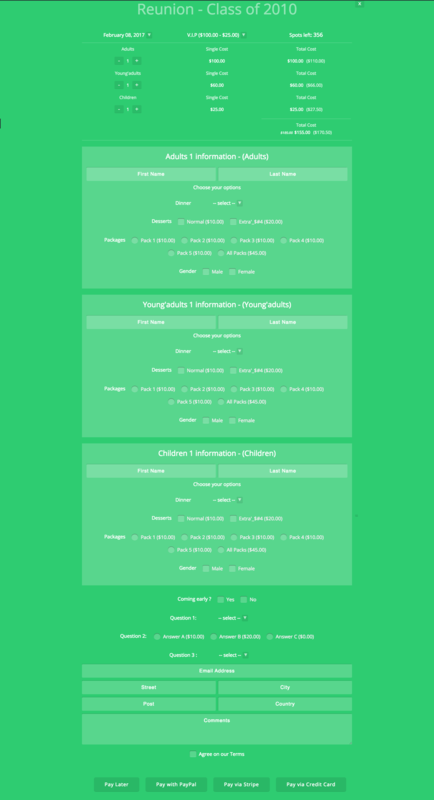 Sub tickets allow you to sell your tickets with different prices to different groups of people. How will this look in the booking form? The booking form will automatically detect if there is sub tickets and will replace the standard quantity mechanism with another one. How do I translate the duplicate field group title ? In Settings -> Booking Form tab you can set the text in Duplicate fields title setting. %name_group% for complex expressions that will only be displayed when more than one subticket. Ex: ‘%name_group% – (%name%)%name_group%’ will display ‘ – (name)’ when possible and will remove it when not. I can not see sub tickets ? This was introduced in vesion 3.8. 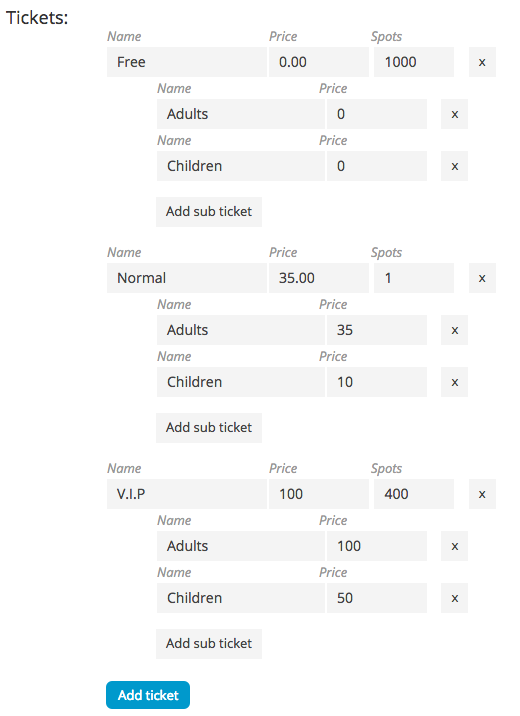 How do I hide the ticket price in booking form in tickets dropdown list ? Toggle Show price beside ticket name off. How do I re-order tickets in booking form ?